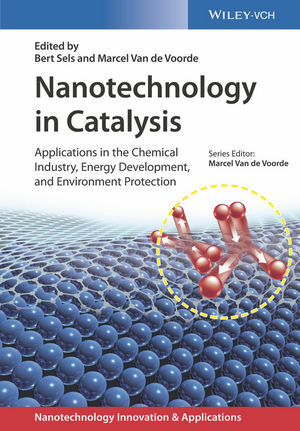 Reflecting the R&D efforts in the field that have resulted in a plethora of novel applications over the past decade, this handbook gives a comprehensive overview of the tangible benefits of nanotechnology in catalysis. By bridging fundamental research and industrial development, it provides a unique perspective on this scientifically and economically important field. While the first three parts are devoted to preparation and characterization of nanocatalysts, the final three provide in-depth insights into their applications in the fine chemicals industry, the energy industry, and for environmental protection, with expert authors reporting on real-life applications that are on the brink of commercialization. Timely reading for catalytic chemists, materials scientists, chemists in industry, and process engineers. Bert F. Sels is currently head of a research group the Center for Surface Chemistry and Catalysis at the KU Leuven, Belgium. He obtained his PhD in 2000 at KU Leuven in the field of oxidation chemistry with heterogeneous catalysis. He was awarded the DSM Chemistry Award in 2000, and in 2005 the Incentive Award by the Société Chimique Belge for his research achievements. In 2005 he was appointed assistant professor at KU Leuven, and full professor in 2012. He is co-chair of the Catalysis Commission of the International Zeolite Association (IZA) and co-founder of European Research Institute of Catalysis (ERIC). Marcel Van de Voorde is special advisor at IMEC, Belgium. Recently, his knowledge and 40 years' experience in university education, research and management was honored with the gold medal of the Fondation du Mérite Européen. He studied industrial and chemical engineering and received his PhD in nuclear engineering from the Nancy-Université, France. He was co-founder and professor at the Hoger Instituut der Kempen, Geel, and the Technical Institute Don Bosco, Hoboken in Belgium. He further holds professorships at the Catholic University of Leuven, the Ghent University, the Delft University of Technology and is visiting professor at several recognized universities in Europe, US, Japan and China. He was active as advisor to various institutions such as the CERN, the European Commission and the Max Planck Institute for Solid State Research.